Total Net Weight 1 lbs. 15.8 oz. Wow friends and family with this amazing Simply Chocolate exclusive Easter Basket featuring premium chocolates from Godiva, Fannie May, Chuao Chocolatier, Madeline Chocolates, and Long Grove Confectionary. 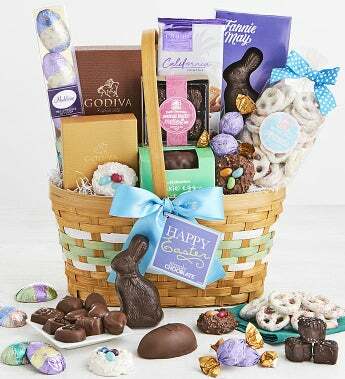 This classic woven basket is brimming with Godiva chocolates including a 15 piece gift box of Godiva Classic Milk Chocolates, a 4 piece Godiva Gold Ballotin Box, and Godiva Lava Cake Truffles. Making it even more impressive are a Dark Chocolate Bunny and Pixie Egg from Fannie May, Long Grove Easter Nests, Dark Chocolate Peanut Butter Melts, and Spring Pastel Pretzels, Madelaine Chocolate Foil Covered Eggs, and a Chuao Chocolatier Salted Caramel Dreamin' Bar.